It’s that time of year when holiday decorations, presents, boxes, and just STUFF starts to overwhelm even the most organized of people. Closets get full, guest rooms because storage catch-all rooms, and you might not even have room for your guests. If this is the case for you, read on to see what you can do about getting through the holidays with some help from your friendly local movers. Even if you know it’s time for an addition to your home, the middle of the holiday season is not always the best time for such an effort. One thing you can do is to get a storage unit and clear a little room to make your home a bit more liveable. Consider putting in things like all the other holiday decorations (Halloween, Thanksgiving, Easter, etc.) taking up space. Clear out the closet and drawers in the guest room so you actually have space for your visiting relatives and friends. Sometimes Christmas itself is enough reason for a storage unit. Do you need help with hiding a large gift? We can move just about anything into storage and work as your happy elves to help surprise your loved ones on that special day. Exercise equipment, furniture, or other large items, we’ll take impeccable care of your items. Do you know you want to have a yard sale in the Spring? Go ahead and put all of the furniture, appliances, and household items in storage rather than having them crowd up your garage. Put your warm season clothing in temperature controlled storage to free up your closet space. After all, you need more room for all of the Christmas presents you’re going to get! Are you planning a move for early next year? You can get a jump on your move by starting to move items into a storage unit. This can give you more space to work if you want to do-it-yourself pack and label boxes. 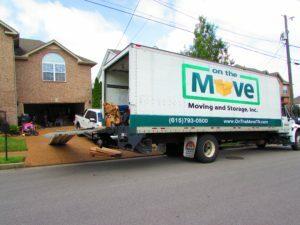 On the Move is experienced in making moves of household items to storage units in Murfreesboro and throughout Middle Tennessee. We have the connections to help you find the exact space you need. 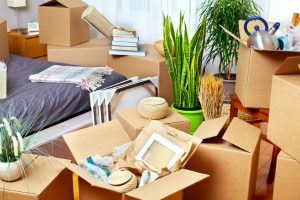 We can also do packing and unpacking services to make sure your items are well-protected during moving and storage. For larger items, like pianos or sculptures, we can do crating for extra protection.